Recipes to Make Tasty Grill Seafood Squid -For you fans of seafood dishes Calamari, on this occasion the team recipes typical dishes will try to present a recipe Make Delicious Seafood Grill calamari special for you this seafood food connoisseurs. As for the material and how to make seafood grilled squid as follows. The first step, Rinse the squid, then dispose of the ink sac, and bone, then set aside. The second step, Mixed spices with tomato sauce, pepper, lemon juice and salt mushroom sauce. Then stir until blended. The third step, ADD squid into the spice mixture, store in the refrigerator for approximately 1 hour. Then, cook the calamari until it looks half-cooked, then lift the squid. Lastly, Bake until cooked squid and looks brownish yellow. Afterwards Remove and serve calamari Seafood Grill you made in the warm. 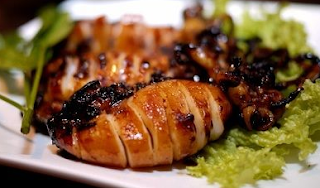 0 Komentar Untuk "Recipes to Make Tasty Grill Seafood Squid"